Full of exotic subject matter, this tapestry "The King Borne" or "The Bearing of the King" was originally commissioned by the French King Louis XIV. It was designed by his personal artist Lebrun, the first painter to the King. Le Brun's works are more known for his traditional French subject matter of courtiers in their daily lives. The original is part of a remarkable collection of 17th and 18th century tapestries of Le Brun's works. Here we see a native tribal king parading through the tropical forest of palm trees, monkeys, rams, peacocks and turtles. 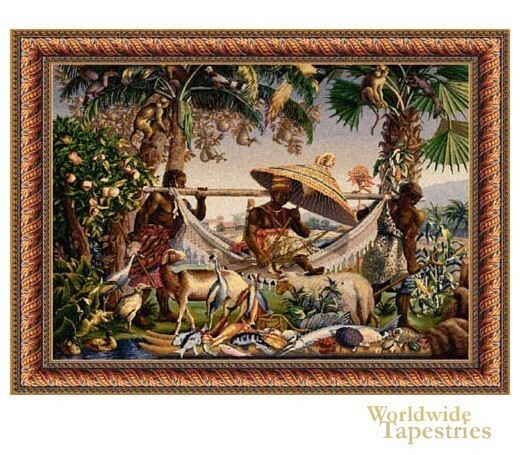 This French art tapestry "King Borne" is backed with lining and a tunnel for easy hanging. Dimensions: W 67" x H 48"
Dimensions: W 84" x H 68"